Submitted by RoundhayBake on June 12, 2015 – 12:16pm. I cannot get the recipe template to work. Never mind, I’m posting it here instead. I love it when your own take on a bread is the latest addition to a chain that extends back into the mists of time. In this case, I was inspired by MC’s blog (http://www.farine-mc.com/2015/05/meet-baker-eric-marche.html) about Breton-based baker Éric Marché. 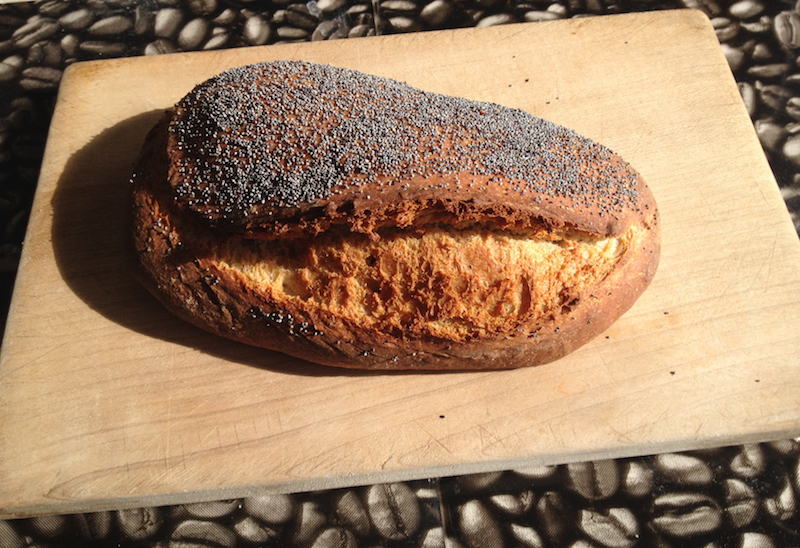 In the blogpost she writes about how M.Marché roasts buckwheat flour for his menhir-shaped loaves. I’ve never been a huge fan of buckwheat bread, but this sounded worth a try. It was. It’s a great idea. Delicious. This is my version of Éric Marché’s loaf, using, as a template, Dan Leader’s Buckwheat Bâtard recipe which, apparently, he adapted, in turn, from an Éric Kayser recipe. Anyway, I hope I’ve done them justice. It makes a beautiful dough, easily handled and shaped. It’s ideal for long cold retardation (Éric Marché keeps his for up to two days). I sprinkle it with black poppy seeds because their flavour complements the buckwheat. I haven’t tweaked the colours at all. 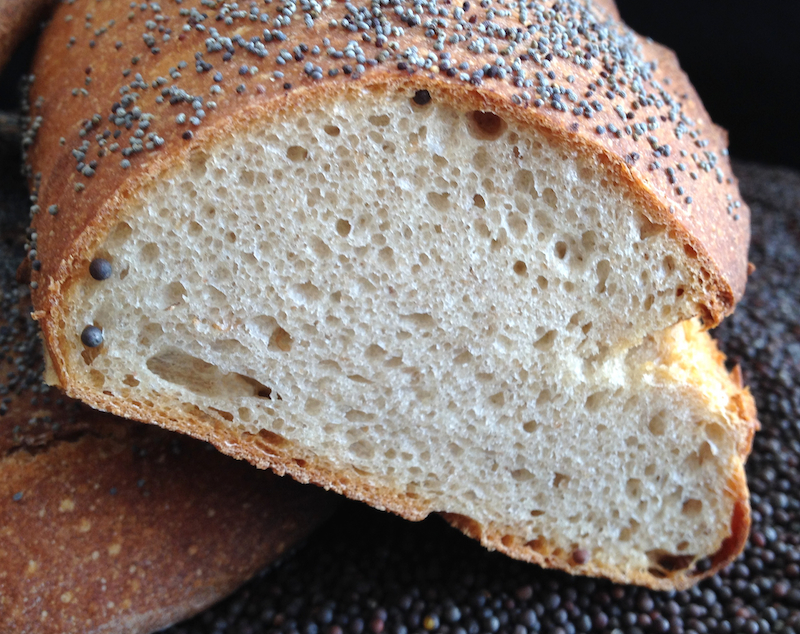 Buckwheat loaves really do bake to this rich russet golden colour. I’ve baked it with both white and wholemeal flours. They’re equally good. The latter needs a much longer fermentation (double-hydration is also a good idea) and gives a more open crumb (see the photo on MC’s blog). Makes 2 x 440g loaves (baked, approx). Roast the buckwheat in a 160/140℃ oven for a total of 15 minutes (mixing it every 5 minutes to prevent it from burning. Mix the ingredients well, cover and let stand for 8-12 hours or overnight. It makes a medium-stiff levain. Don’t expect a huge amount of activity with buckwheat flour, but you should expect to see a moderate increase in volume. Combine the buckwheat levain with the water. Break up the levain so it can be easily mixed with the rest of the ingredients. Add the bread/wholemeal flour, buckwheat, and roast buckwheat. Mix well. Add the salt. and mix. Knead until the dough passes the windowpane test – about 5 minutes with a stand mixer (or 8-10 minutes by hand). You will have a smooth, creamy dough that still tears if you pull at it. Leave it in it’s bowl, cover, then bulk ferment the dough for 1 hour. Stretch-and-fold in the bowl, rotating one quarter between folds for one complete turn of the bowl. Do the windowpane test. It you feel the gluten is still under-developed, do another stretch-and-fold. Cold retard for 6-10 hours (or overnight). 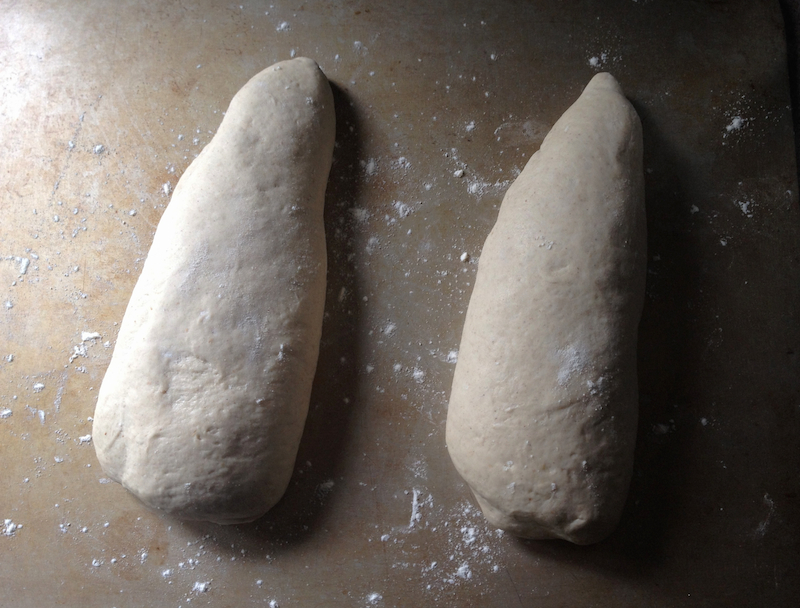 Then gently de-gas, divide the dough, and pre-shape into boules or blunts. No need to be fancy: do it in four quick turns per boule – you don’t want to rip the skin. Shape into menhirs. To do this gently de-gas each boule/blunt again. Next flatten and stretch them into the form you’d use to shape a bâtard, but with one side being shorter than the other. Now stretch and fold under tension – again, just as you’d do with a bâtard – but don’t seal the final fold with the heel of your hand, leave it as it is. You should now have two loaves, each in the shape of a blunt-nosed cone (see photo below). Set aside, make sure the seam is on the side of each loaf, cover, and prove for 1-2 hours. Preheat your oven to 230/210(fan)℃. Prepare your steam tray too. When the loaves are ready, spray their upper surfaces with water then sprinkle with seeds. Score to enhance the shape by running your lame along the seam on the side from tip to base. Steam the oven. I just pour water onto my steam tray which has been sitting in the oven for ten minutes. A few squirts of water onto your baking stone can also be a big help. Bake – immediately turning the heat down to 220/200(fan)℃ – for 25-30 minutes. Remove the steam tray after 15 minutes into the bake. Once the loaf turns a golden russet brown and the base is hollow to the tap, remove from the oven and set aside to cool. 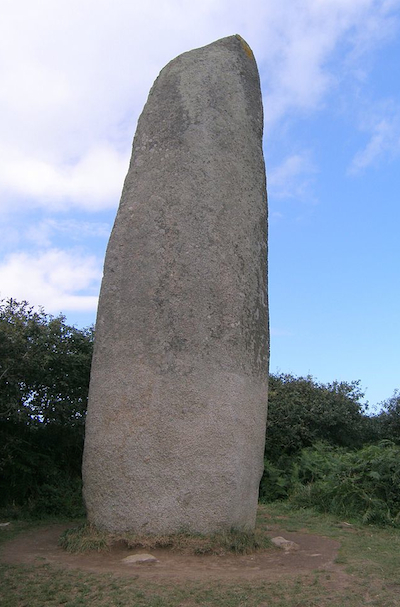 Menhirs are ancient standing stones, sometimes six or seven thousand years old. Thousands of them are found in Britain (Stonehenge), Ireland, and northern France. In particular, they dot the landscape of Brittany (the forest of them at Carnac has to be seen to be believed), hence Éric’s inspiration. And, as those of you who read Asterix and Obelix books as a kid will know, a menhir is also the giant rock Obelix uses habitually as a weapon to flatten Roman legionaries. I was a childhood fan (still am), so I just couldn’t resist. Great with cheese or cured meats.